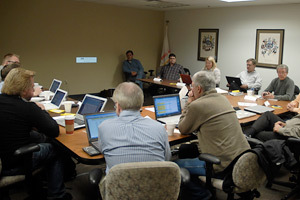 Members of the Board of Directors in session on Thursday. The Drum Corps International Board of Directors came together in Indianapolis Wednesday and Thursday for a scheduled business meeting at the organization's new downtown headquarters complex. The meeting marked the first official gathering of the board at the recently-completed Washington Street location. One of the milestone agenda items for the two-day session included the review and approval of a $10 million operating budget for 2010. "This budget was laid out in support of a five-year strategic business plan which was presented to and approved by the Board of Directors in September," said DCI Chief Financial Officer Wayne Leide. "The budget goes a long way toward helping us build a strong financial base while reestablishing reserves for the organization, which will in turn support the growth of the collective over the course of the next five years." An afternoon session on Wednesday included a presentation by Indianapolis Convention and Visitors Association (ICVA) executives Don Welsh and Matt Carter, reaffirming their commitment to Drum Corps International and the city's ongoing partnership to ensure the success of the DCI World Championships for years to come. "It was reassuring to hear the ICVA's level of commitment to DCI and toward helping us improve our championship events in Indianapolis," said DCI board chairman Mark Arnold. "This is a partnership that will continue to grow in the future and will help add so much more value to the event for our participants, their loyal fans and our valued corporate partners." Late Thursday morning, director Randy Blackburn and other representatives from the board of directors of the Jacksonville, Fla.-based Teal Sound Drum and Bugle Corps, made a presentation in support of the corps' application to compete at the World Class level on the 2010 Drum Corps International Tour. "This morning's presentation by Teal Sound is part of a process we have been developing over the past several years to help ensure the corps applying for membership and access to the DCI Tour schedule are financially and organizationally stable," said Arnold. "Part of our new five-year business plan is focused on increasing the number of participants in the activity, and the board of directors is becoming increasingly active through mentoring and in establishing programs designed to assure present and future member corps will be able to achieve long-term sustainability." Arnold said that when Drum Corps International convenes its annual business meeting in January, the board is expected to recommend to the full voting membership that Teal Sound be given access to the 2010 schedule to compete within the World Class division. The DCI Board of Directors will meet again just after the new year on Jan. 10, 2010, one week before the meeting of the full voting directorship convenes in Indianapolis.